District seeks IT engineer-technician - Hamilton School District. 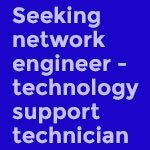 Are you a skilled network engineer? Consider joining the Hamilton School District. More information is at: www.hamilton.k12.wi.us/prospective-families-staff/join-employee-team/support-staff.